The Theme-Rheme Classification (TRC) lends itself to the cultural and linguistic analysis of scientific texts, possessing the advantage of being a practicable – and therefore intersubjectively verifiable – principle. On the sentential level, the content of a sentence becomes accessible to the audience via the functional sentence perspective, and with the application of TRC at the textual level, the underlying framework of the text can be established. Previous literature has also recognized the fundamental importance of TRC: According to Benes (1981), TRC is "one of the regularities that are part of sentence complexity and organization of text (‘textualization')." Here, the rheme plays the decisive role communicatively, while the theme is more relevant for the composition of the text (Benes 1981: 207). The coherence-building capacity of TRC is discussed in Gülich and Raible (1977: 75) and Hellwig (1984: 1). Gerzymisch-Arbogast (1985: 19) addresses the interesting question of whether TRC could also be used as a boundary criterion for particular text types with various functions. The review text type, being a "self-contained" composition, lends itself particularly well to a TRC analysis. This stands in contrast to longer monographs or essays that would require far greater effort, thus rendering it too large a task for an individual researcher. The following paper will present the results of two such analyses exemplifying the utility of TRC investigations, while also shedding light on the different functions of the literature review text type. The results of the exemplary studies relate solely to the relevant texts; a further generalization of the conclusions would thus require further research, which could potentially be guided by the results of this study. For our exemplary studies, we assume that the determination of theme and rheme depends on the communicative situation. In our case, the review is analyzed in the context of its function as a means of scientific communication. The following investigation corresponds with this type of communicative-linguistic approach. A review is a report: the event is the reading of the book by the reviewer. It should be informative, evaluative and may also be directive: to the writer of the book, potential readers or publishers. General reviews are often criticized for not being informative: special reviews are differentiated from general in the requirement that they be informative of the book reviewed and, in common with many special texts, that they are more self-consciously written, edited and read […] the review limits itself to the scope of the book reviewed, or embarks upon a wider survey, with the organizational structure of the essay, the technical review, or the special leader (ibid. : 151). The fundamental basis of the review in scientific journals is the schema "Report – Critique – Evaluate." Scientific journals establish a standard form for the review based on this schema; however, variation from journal to journal is also possible. On the one hand, it is all about the resolution of a contested problem, where the interlocutors are in a medium of universality that should facilitate a cooperative establishment of truth. On the other hand, it is a debate between scientists, where each participant acts and competes as an individual for the purpose of gaining personal advantage over another (ibid. : 77). because he as a scientist is by definition working under official appointment toward the advancement of knowledge, his first priority must be the pursuit of truth. This occurs independently of any particular interests and is based on the idea of true universality […] on the other hand, he also knows that a truly cooperative pursuit of the truth is simultaneously a hindrance to his own career. The less his colleagues achieve, the more his own achievements are brought to the fore. The will toward the truth is formed through social particularities (ibid. : 78; emphasis added). The aforementioned model could be expanded by including further elements. Regarding the target audience of the viewer, there could be multiple target groups that need to be considered, which the reviewer addresses with different intentions. The English translation of Norbert Dittmar's book, Soziolinguistik, a landmark in the development of sociolinguistics in West Germany, was described by Bills (1979) as ‘chaotic' and criticized for its ‘lack of focus and cohesiveness', ‘haphazardness of presentation', and ‘desultory organization'. None of the four reviews of the original written by scholars from Central European universities […] make any criticism of this kind (Clyne 1981: 64). The above-mentioned aspects of the review sufficiently address the complexity and range of expression of this text type. The following discussion cannot possibly expound on all of the mentioned elements; likewise, examples for all of the introduced ideal forms cannot be provided. The purpose of the empirical part of our article is limited to exemplary analyses of a considerably standardized and non-standardized review, with the working hypothesis that they will differ in their TRC. We take our first review from the Kölner Zeitschrift für Soziologie und Sozialpsychologie (The Cologne Journal of Sociology and Social Psychology).2 Here we are presented with a typical review for this journal, with the "pursuit of truth" as its focus: the reader encounters a text that objectively informs without a polemic, yet also offers critique of new published materials in the relevant fields.3 One can therefore hypothesize that the central theme of this type of review is the book itself, whose various features (problem statement, structure, inadequacies, usefulness, etc.) are discussed in the framework of the field. The thematic progression should therefore be continuous. 1 A critique of Galtung (1979) from a linguistic perspective is still absent. 2 The relevant text is a review of Michael Beckmann's "Theorie der sozialen Bewegung" written by Clausjohann Lindner, München 1979. 3 This of course does not exclude the "pragmatic inconsistency", but rather implies it: Under the pretext of the pursuit of truth, and with an objective tone, the reviewer is also naturally profiling himself. The TRC shows that we are dealing with a coherent text, despite being only minimally pronominalized and paraphrased, but rather more repeated (e.g. central termini). Thematic breaks or jumps are not apparent: When viewing the text as a whole, each individual sentence logically follows its predecessor; likewise, the reviewer has arranged the paragraph structure into three parts to express the following intersentential modes of communication: reporting – critique – evaluation. Figure 2: Theme-Rheme structure of a review in Kölner Zeitschrift für Soziologie und Sozialpsychologie. In our second example, Jürgen Habermas reviews the book written by Sloterdijk Kritik der zynischen Vernunft (‘Critique of Cynical Reason').4 A very brief glance at this review reveals that this text is not at all standardized, and can only with great difficulty be organized within a model. An analysis of the extra-linguistic and pragmatic background suggests that the primary purpose of the text is the profiling of the reviewer. The following facts support this suggestion: Sloterdijk's book is one of only a few philosophy best sellers of the last century. Sloterdijk is difficult to categorize within a paradigm, but can loosely be connected to Nietzsche, Heidegger and "Spontis" (member of a political activist movement in the 1970s and 80s in West Germany propagating „being spontaneous").5 The latter, influenced by the Frankfurter Schule – whose leading representative is Jürgen Habermas – attempts to address the reviewer and argumentatively introduce his own positions. This is supported by the fact that this review was first published in the journal "Pflasterstrand", one of the most well-known organs of the "Spontis". The text also contains numerous presuppositions that can only be grasped by participants or experts within this particular milieu. Through this review of Sloterdijk's book, Habermas attempts to claim the "Spontis" for himself; he offers thus less of a discussion of the book (a certain amount of knowledge from the reader about the content of the book is assumed), and more of an addendum. The reviewer praises, criticizes and appropriates the book, but also shows how the set of problems can be solved. 4 First published in: "Pflasterstrand", Frankfurt am Main, June 4-17, 1983. 5 The specific details behind the concept "Spontis" will not be further discussed as it is far beyond the scope of this article. 6 In determining the theme and rheme in this case, we did not limit ourselves to sentence boundaries: on the one hand, not all sentences could readily be attributed to a given theme because they were purely rhematic; on the other hand, some complex sentences occasionally contained multiple themes and rhemes. We interpret the title of Habermas' review Zwischen Heine und Heidegger. Ein Renegat der Subjektphilosophie? as rhematic, though the interrogative suggests a certain thematization of the whole text: the review shall determine whether Sloterdijk is a renegade of subjective philosophy. However, if one views the text not only as a means of communication, but also as a result of communication, it is apparent that – from the perspective of Habermas' intentions – one could replace the question with an exclamation mark. 6. a Habermas element (critique, statement of the problem, Habermas' position, etc.). In addition to these elements, a rhematic prelude and epilogue can be identified, which in this case are unconnected to a theme. The text's coherence is based on the communicative situation. In general, the coherence of this text stems primarily from the content, previous knowledge of the reader, the resolution of presuppositions, etc. The logical structure of the text can thus only be ascertained in the context of a mutual discussion (reader and writer). Hence, a TRC cannot be constructed using linguistic tools alone: a communicative-linguistic analysis of the text is a prerequisite for TRC. 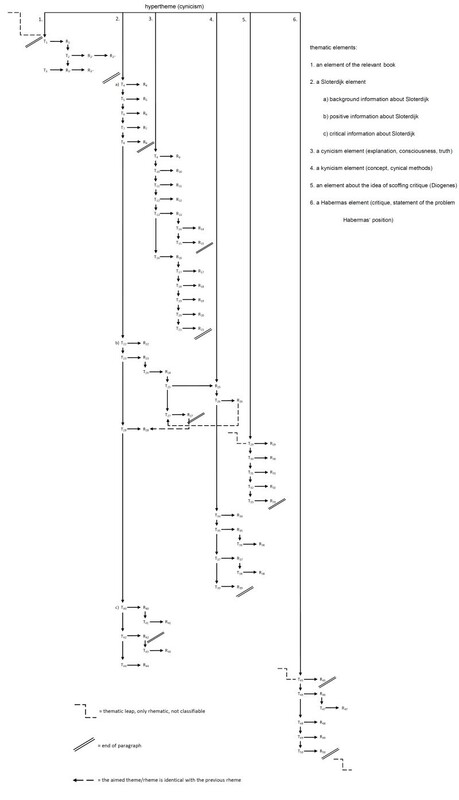 Sentence semantically multilayered texts are not to be structured one-dimensionally following the KNOWN-NEW sequence. This is also true for scientific texts in case the ongoing argumentation is consistently overburdened with secondary information, cross references, relativizations, preventive safeguarding, exemplifications, explanations etc. (ibid. : 296). A cursory look at Habermas' text leaves little doubt that this is the case with his review. We therefore decline to make further interpretations here about the TRC of Habermas' texts, and conclude that the paragraph structure in this text is not always compatible with TRC. Figure 3: Theme-Rheme structure for Habermas' review. The completed investigations show how the thematic structure of texts can be reconstructed using TRC. 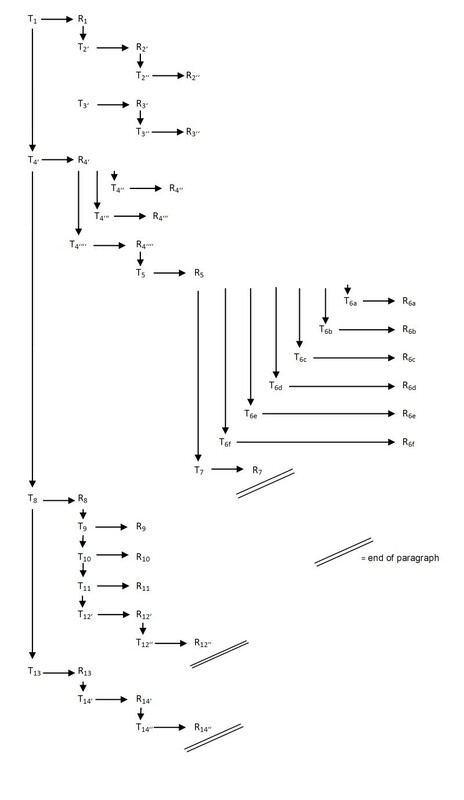 Furthermore, these examples demonstrate that the TRC is not just dependent upon the text type, but that it also stems from the function of the text: heavily standardized reviews appear to favor a continuous progression, while "profiling reviews" appear to be implemented using a thematic progression with a hypertheme. The persisting uncertainty in determining the theme and rheme in a TRC analysis – and the substantial effort in carrying one out – call to question the ultimate utility of this principle for interpreting texts. Investigations focusing on longer cohesive texts could eschew the evaluation of theme and rheme at the sentential level, thus focusing on larger units, for example the paragraph or chapter. In this case especially, the goal is to go beyond the realm of content so that the text can be understood as a whole, and within its function as a product of communication. Schröder, Hartmut (ed.). 1991. Subject-Oriented Texts. Languages for Special Purposes and Text Theory. (Research in Text Theory 16). Berlin/New York: de Gruyter. Kusch, Martin and Hartmut Schröder (eds.). 1989. Text – Interpretation – Argumentation. (Papiere zur Textlinguistik/Papers in Textlinguistics 66). Hamburg: Helmut Buske. Benes, Eduard. 1981. Die formale Struktur der wissenschaftlichen Fachsprachen in syntaktischer Hinsicht. In Theo Bungarten (ed. ), Wissenschaftssprache. Beiträge zur Methodologie, theoretischen Fundierung und Deskription. München: Fink. Clyne, Michael. 1981. Culture and discourse structure. Journal of Pragmatics (5). Galtung, Johan. 1979. Deductiv thinking and politicial practise. An essay on Teutonic intellectual style. In Johan Galtung (ed. ), Papers on Methodology. Essays on Methodology.Volume II. Copenhagen. Geier, Manfred, Marianne Mehrkorn and Ulrich Schmitz. 1977. Zum Beispiel Argumentieren. Ein Beitrag zum Verhältnis von synchroner, ontogenetischer und historischer Rekonstruktion. In Klaus Baumgärtner (ed. ), Sprachliches Handeln. Heidelberg: Quelle. Gerzymisch-Arbogast, Heidrun. 1985. Zur Thema-Rhema-Gliederung im Sachbuchtext. Special Language – Fachsprache (1-2). Gülich, Elisabeth and Wolfgang Raible. 1977. Linguistische Textmodelle, Grundlagen und Möglichkeiten. München. Hellwig, Peter. 1984. Grundzüge einer Theorie des Textzusammenhangs. In Annely Rothkegel, B. Sandig, and M. Weissgerber (eds. ), Text – Textsorten – Semantik. Linguistische Modelle und maschinelle Verfahren. Hamburg: Buske. Sager, Juan C., David Dungworth, and Peter F. McDonald. 1980. English Special Languages. Principles and Practise in Science and Technology. Wiesbaden: Brandstetter. Von Polenz, Peter. 1985. Deutsche Satzsemantik. Grundbegriffe des Zwischen-den-Zeilen- Lesens. Berlin/New York: de Gruyter.